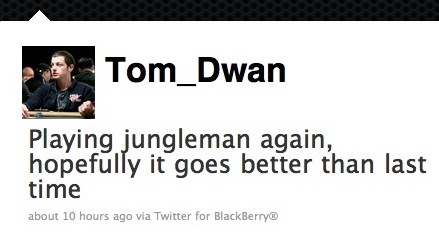 Supposedly the big news on the Tom Dwan vs. The World front is that Jungleman — my personal heads-up coach thanks to free poker training with CardRunners — will be Durrrr’s next opponent in the super-big-stakes Durrrr Challenge. While I personally think these are relevant matches in the legislative and regulatory realm — where else can you see that much money transacted, repeatedly, potentially across international borders, without Uncle Sam having his finger in the pot other than maybe Mafia Wars or real-money cocaine deals? — Wicked Chops has what could be the single best post ever about the significance of Tom Dwan’s ongoing namesake poker invitational.